Machina Carbonado gloves are designed with the female hand and wrist in mind. The difference is a slimmer profile than comparable gloves. Carbonado gloves are a good choice if you find other gloves to be somewhat awkward or if you prefer a more fitted feel. "Carbonado” is the technical name for black diamond, and Carbonado gloves live up to their tough name by being skinned in high quality genuine leather for supple durability; stitched in nylon for strength; lined in waterproof nylon and fashioned around a high-density foam core for maximum protection. Whether hitting the bags or working the mitts, these are a girl’s best friend! Carbonado gloves are superbly balanced and have pliable padding, so making a fist is nearly effortless. You’re going to want to start throwing punches the moment you get them on! See below for Fit & Care Guide and Reviews. Our Carbonado 12 gloves are ideal for a woman with SMALL hands and wrists. These will feel custom-fit compared to other 12 ounce gloves. If your hands are average for a woman or if you are a heavy puncher who needs a bit more padding, you may be better off with our 14 or 16 ounce gloves. "I love these gloves and I just don't want to take them off! They look smaller than gloves of the same size in other brands, which can be a bit unsettling at first but it's actually perfect - the weight is there and they are simply more fitted and better suited to my (rather small) hands than any other gloves I have ever tried. In terms of performance I feel it makes my punches more precise and powerful. I keep having people at my kickboxing club coming to ask me where I got them, including my instructor. They are also very stylish. I have got a pair in that nice burgundy red and would love to get a gold pair one day!" "I love these gloves! The trial gloves given at my gym were a 'one size fits all' and by "all" they mean men's size hands. These gloves are perfect for smaller hands / wrists and make the boxing experience so much more enjoyable! I will buy another pair once I wear out the foam in this pair!" "Awesome gloves - perfect fit, perfect support, look great. So happy with these!!!! I live in the UK - you can get these from the shop in Paris "L'arene" via their website. They will ship to the uk and are super helpful and friendly." "These gloves are amazing for working the mitts with my trainer! The light weight is perfect for hand speed and its a very comfortable fit for my hands. I am impressed with how similar they are to fighting style gloves. These are exactly what you would want as a boxing fitness client." "Love these gloves, just got them and headed to the gym to work on pads and bags. The gloves felt like an extension of my hand. The leather and the color (I got the red ones) are badass and got tons of compliments. More importantly, my punches were on point with gloves that actually support my wrists properly (I have tiny wrists!)." "I love these gloves!!! I have small hands which I feel other gloves just swallow my hands, which the Carbanado 12 just hug them. I also like how I can wrap my wrist tight for the extra support." "The gloves are comfortable right off the bat which is awesome and I love the fit. Comfortable and light weight and it's simple to get them on and off. Not to mention they are gorgeous. I am very pleased and would highly recommend them!" "I ordered the gloves on 9/18, received them the very next day by noon. I got the baby blues & they are just so awesome, I can not wait to use them tonight!!! A++ Machina!!" "Excellent product. Put them on and immediately went into pad work. No need to break them in, they simply felt like an extension of my hand from the outset. Nice weight for speed drills and bag work." "Excellent product! Easy to put on, form-fitting for my hands without being too roomy or tight... Let's just say when I was holding pads, everyone else in the class wanted to be wearing these gloves." "Got the yellow gloves for Kickboxing and Muay Thai and the fit like a glove (pun intend). Seriously, so comfortable and snug. Made my wrists feel very supported. The service was great! Will definitely order from them again!!" "My wife has finally found and fallen in love with a true women's glove! She's been through a lot of em and she's truly appreciative. She looks no further now." "Love my gloves; they fit so well and even smell good. I have recommended them to lots of people." "At first I thought the gloves were too tight ... but then when I used them on the bag it was a completely different story. I felt much more supported in the wrist and more protected in the knuckles then with most other gloves I've used in the past. I really like these gloves! I had 6 other girls try the gloves... everyone was impressed with the comfort and protective feel of the gloves..."
"So far I have used the (gloves) for bag work, double end bag and various drills with some of my students. I like that these gloves fit tighter around my hand and wrist. The leather is soft and feels nice. There was no "breaking in" period since these felt good right out of the box. Overall they are very comfortable while still providing protection of the hand." "I broke in the gloves and... they are great. I love em." "Happy to see a company making products for women. Most companies just make pink gear and say it's for women, even though it's a guy's cut." "I am so impressed with the customer service and the gloves! Thank you... I will be sure to spread the word!" "I had been searching for a lighter training glove for some time and I'm very pleased with my Carbonados (12 oz). They're well padded but not too bulky. I've yet to find another pair of gloves that fit like the Carbonados. Everything else on the market just felt too heavy and cumbersome. In any case, I highly recommend these for anyone seeking a lightweight glove." "Bought 12oz ones on clearance bc I did not want to make investment in heavier ones without really knowing company. So I got them and worried about the tight fit at first but they stretched out just right. Fit real good. Considering getting heavier ones now. Long story short...these are awesome. Also, so glad there is a company that makes gear for women in a real practical manner. Making it for women does not just mean making it in pink..."
"I really liked the fit of these gloves, I think you did a good job, easy to put on, feel nice on the bag. "I like the gloves yet they are tight when worn with hand wraps. I had hoped after wearing/using for several weeks, they'd stretch a bit and shape to my hand." "Bought the gloves on Saturday & they arrived on Tuesday. Not only was the shipping fast but the packaging was carefully done. The gloves fit perfectly & my punches feel better." "LOVE my Carbonado gloves. In my other set of (unisex/male) gloves I was constantly tweaking my wrist. Once I got my Machina gloves, which are designed with a narrower wrist to fit women, I didn't have any more problems. The color is also super unique." "I have the Carbonado 14 gloves. They are perfect - I love them! I have small hands and they fit well. They're comfortable and beautiful as well. I bought the 12s first and they were too small. I contacted Machina customer service. I was able to return the gloves and get the correct size sent to me within a few days. Very pleasant experience. I will be buying from Machina again!" "I have what some may call 'baby hands'. Previous styles of boxing gloves were just WAY too big on me, but these fit great with my wraps and I don't have to re-adjust mid session because they're sliding around. They've got excellent wrist support and were definitely designed with the smaller female hand/wrist in mind. The leather is quality and I'm very excited to find gloves that actually fit." "These gloves are amazing! They truly are fashioned for smaller, female hands without sacrificing protection or quality. One can see the attention to detail, not only in the gloves themselves but also the packaging in which they arrive and the speediness in which they arrived after having purchased them. Definitely buying other Machina gear in the future." 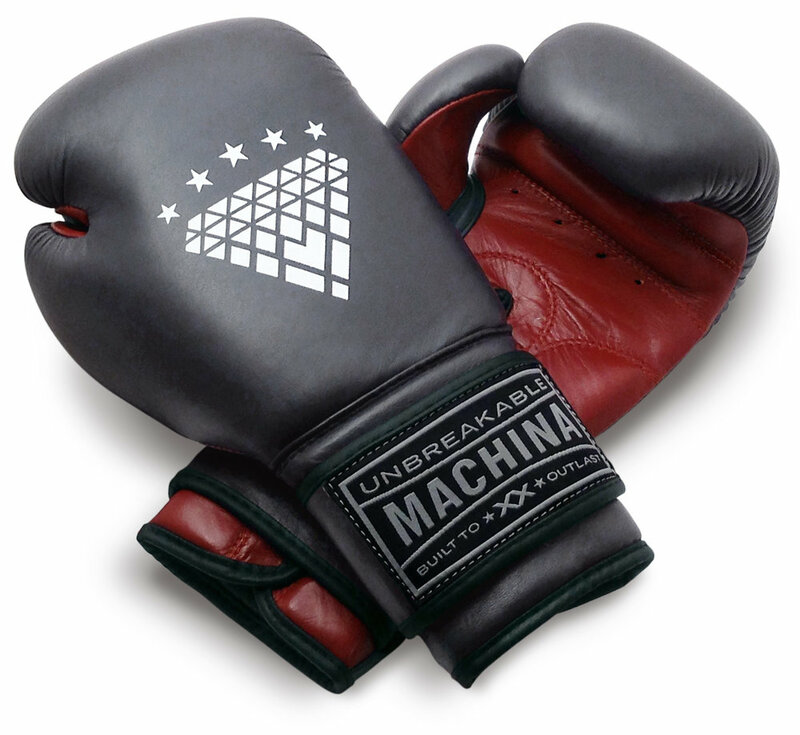 "...Because Machina has designed their gear specifically for women, the fit is incredible. There is no extraneous bulk of the 'one size fits all' typical boxing glove. The natural curve at the palm promotes a secure fit and lots of support at the wrist and hand. The wrist wrap also keeps the gloves securely in place through several rounds of training... And for such a well made glove, the price is really spectacular. I chose the light blue gloves. I have never seen this color in gear before and it definitely gets noticed at the gym! The logo on the glove is super cool, and the brand label is professional and well made. All in all, I would recommend these gloves to anyone! I will probably be ordering them in yellow... Once you find something awesome for training, why not get it in every color?? Way to go Machina!!" "I have used many gloves and have to say these are my favorite. The material is nice and lightweight, yet study and durable. After breaking them in, they literally feel like they've been custom molded to my hands. No more big bulky unisex gloves! Highly recommend. Also, I have to say that the padding in many gloves tends to crumble over time. I've been using my Carbonado diligently for months now and no sign of crumble. Love." "Soft & durable!! Great fit!! Best pair of gloves I have ever used. And I've owned Everlast and Hyabusa boxing gloves." "I do not consider my hands to be particularly feminine, so I wasn't sure if my big 'ol hands would fit in these gloves. Not only do they fit, they feel great on the bag and on the mitts. The craftsmanship is great as well. I love these gloves, thank you Machina!" "I had been shopping for the perfect pair of gloves for awhile before I tried on a friend's pair of Machina 14 oz. I loved the feel right away and decided to look into buying a pair of my own... After my first round on the heavy bag, I was hooked. The feel is definitely more compact, stiff, and sensitive than some of the 'puffier' gloves I have tried before, which I appreciate, and as others have mentioned, the wrist support is very good. There is a lot of attention to detail and quality in the construction - they seem like they're custom made, and I love the look and feel of the red leather model I chose." "My husband got these for my birthday (I may have suggested!) and I'm in love. They're the first gloves to fit my hands, they're balanced, they're solid, they're amazing. For the first time in my ~8yrs boxing, I love my gloves. Machina you made one helluva product!" "I bought a pair of the 14oz gloves for my girlfriend last year and I was very pleased with the quality. Shopping for "female" boxing gloves can be a chore because all you have is a selection of pink gloves of questionable quality. 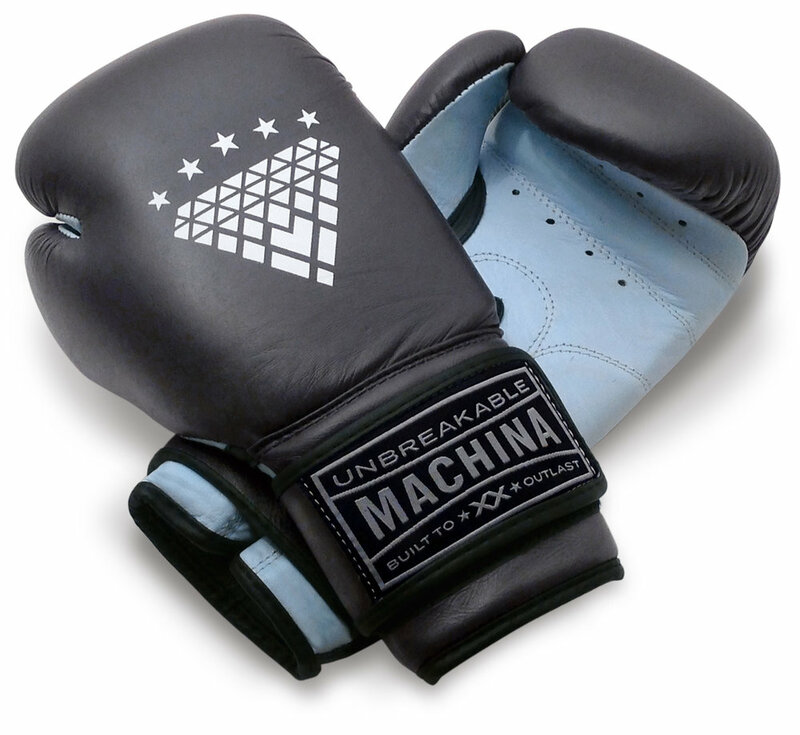 I was extremely happy with the look of the gloves; they are a very nice pale blue with the Machina logo and of very nice quality. ... I would say the leather of the Machina gloves felt very nice and soft, yet firm. The hand compartment of the glove was very narrow and comfortable. I put them on and they felt like a tight 10oz fight glove which is perfect for my girlfriend who obviously has smaller hands. I would honestly recommend these gloves to anyone looking for a well-priced, high quality glove for women that breaks away from the same pink gloves that are being marketed to you." "I really like the extra weight of these gloves. I use them to hit the heavy bag, shadow box and when I want to get a little more of a workout for my arms. When I'm not as focused on speed, and I'm searching for a power workout I put these gloves on! Even as a 14oz glove they are still a great fit for my hands." "...These gloves fit perfectly and have awesome wrist support. My only complaint... is the stitching on the Velcro wrap is fraying. My simple fix was to snip off the loose thread. Other than that I highly recommend these gloves!" "Easily the best gloves I have EVER worn. Not only is the fit perfect, but the quality is fantastic. You will not find a comparable glove on the market, and the price is absolutely fantastic!" "I love these gloves! They keep me from squeezing my fists and feel light as a feather, which helps tremendously for long training sessions. Everyone at my gym has tried them on and loves them. Even my coach loves them." "I own a pair of 12 oz. and 14 oz. Carbonado gloves and love them both. I have small hands and men's gloves leave too much space at the end of my fists. Carbonado gloves provide a superior fit. Also, Machina's customer service is outstanding. They stand behind their products and take customer satisfaction seriously. I recommend Machina's gloves highly." No reviews yet. Be the first to write something helpful for others.